What’s Your Oldest UFO? was the question of the day at guild last week. I had to confess** to the Self Portrait. I started this piece in a class with Pamela Allen in 2006. The class was great, I learned a lot and finished two other pieces, Flower Garden and Beach Town from that class. Those are great pieces, so why is this not a great piece. AND why is it not finished? I have always thought the problem was the hair, that I couldn’t find the right hair. I don’t even know if I have tried to add hair. I have thought about adding hair, but I never seem to do it. I like the eyes, but wonder about a nose and lips. I also like the flowers at the bottom. They need some enhancement, for which embroidery will be great. Clearly this is more of an image of the way I think about myself or the way I was at one time in my past. 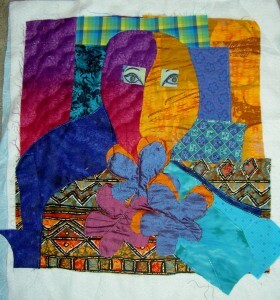 I would like to finish it since it will involve beading and embroidery, which I really like. Somehow I can’t seem to do it. ** confess is a strong term and I am only using for the sake of emphasis. There was no judgment and lots of laughter as we listened to each other. Well, I have to **confess to a paper-pieces Mariners Compass started at my very first quilt class that I took with a friend of mine back in the ‘90s. Still plan to finish it some day. ??? Well, I have been quilting for two years. I have Kaffe Fassett log cabin quilt more than half done. I started it in 2016. I just need to take it out and sew, but I keep having other ideas. Alethea Ballard said to me that I had not been quilting long enough to have a UFO that old. Alethea Ballard is not the UFO boss. My oldest is a sort of watercolor quilt. I may get to that within the next few months. We shall see. As far as your self portrait here, maybe she needs a robber’s mask on her lower face and a hat so she doesn’t need hair. Do you still like the watercolor quilt?